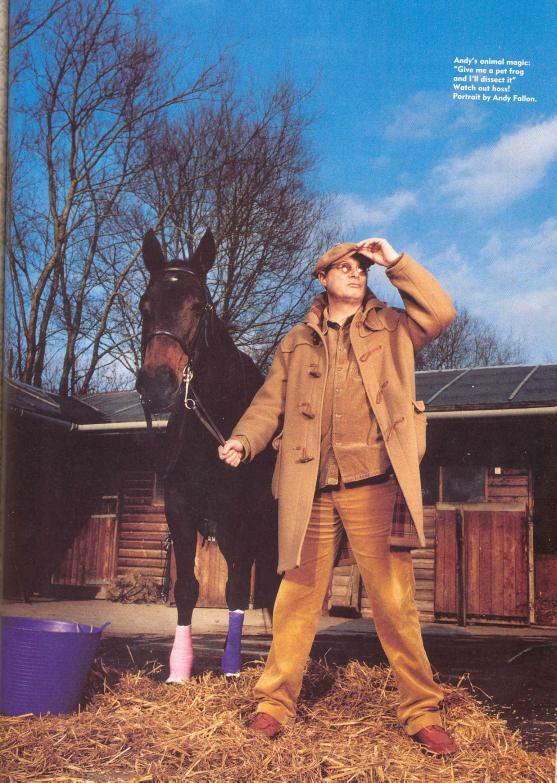 Andy Partridge: Small-town but perfectly formed. SWINDON, TUESDAY, NOVEMBER 12, 2002. BEARING IN MIND HIS BACK CATALOGUE, it may not be too surprising to learn that Andy Partridge is an assiduous recycler. In the front garden of his terraced two-up two-down in Swindon's Old Town, two plastic boxes await collection, their contents betraying a fancy for outré health-giving beverages: organic vegetable juice, elderflower cordial and something called Eskimo 3. XTC's 49-year-old head honcho has yet to arrive, but MOJO receives a long inquisitive stare from the group's other mainstay; Colin Moulding, as he drives past in a battered white car. Most people form bands to move out of their hometown. Partridge and Moulding stayed behind - their retreat from pop life inextricably intertwined with the 1982 breakdown that saw Partridge terminate the group as a live entity. Understandably, he's resistant to the notion that this alone accords him any degree of eccentricity: "I have a problem with that tag, to be honest. To me, eccentric means damaged. And thankfully; I'm not Syd Barrett and I'm definitely not Michael Jackson. If the songs mythologise Swindon, then that's fine. But I don't. I'm governed by my phobias and fears. And when you're like that, you're comforted by what you know." Partridge's world may be small, but seemingly it has everything he needs. Freshly delivered parcels of American toy soldiers sit atop the kitchen table, ready for a lick of paint. In the back garden is the studio where the baroque English psychedelia of Apple Venus Vol. 1 was put together. It's here too, that Partridge has been polishing a seemingly inexhaustible supply of outtakes and unreleased songs spanning XTC's 25 years for a 10-CD project called Fuzzy Warbles. Moulding - whose profile in XTC seems to dwindle a little more with every passing year - is conspicuous only by his absence from the entire project: "That was unfortunate," says Partridge, "because he only opted out at the last minute. He said he just felt his songs weren't good enough, although I don't know if that wasn't the real reason. So sadly, I have to put it out under my name. "Colin seems to think that there's too much of this ‘revealing the magic behind the songs’ going on. But for me, that is the magic. I'm not that interested in watching a magician's act - but show me how the tricks are done and brilliant! I just need to know how things work. I'm one of those people who, if you give me something, I'm very tempted to take it apart. Hahahaha! Give me a pet frog and I have to dissect it, I'm afraid!" IT'S AT THIS POINT THAT MOJO FEELS compelled to inform Partridge that he conforms very closely to the textbook psychological profile of a serial killer - an only child with an uncommon interest in dissecting things. He briefly contemplates the notion. "I couldn't. It's too messy. Hahahaha! The police had better not undo these floorboards!" With plans to unleash two volumes of Fuzzy Warbles every six months, XTC fans should brace themselves for a deluge of activity. Also undergoing fine-tuning in the shed is a forthcoming album recorded with New York avant-gardist Peter Blegvad. Loosely based on "the adventures of a modern day Orpheus", Sparagmos sees Blegvad's sinister poetry brought to life by Partridge's explosive jazz-noir arrangements. Thirty songs co-composed "over the phone with Robert Schneider from Apples In Stereo" also await completion. Rather more surprising - considering Partridge's retreat from the mainstream - are his recent writing sessions with chartpop composer du jour Cathy Dennis. "Well, here's why I wanna do it," he declares, just a touch defensively. "I wanna make some good money and I want to see if I can write songs that are as good or better than the MOR material that set standards for me when I was younger. It's OK existing in your little world, but ultimately you need to lay down those old ghosts. You have to do something that can stand next to Bacharach or Lennon & McCartney. I'm no longer interested in pop stardom, but if I can up the quality of someone else's material and pay my rent at the same time, then brilliant." Robbie Williams could probably do with a hand. "I think he needs a hand and a foot and every other organ you can mention. He's basically Norman Wisdom isn't he? He should give me a call and I'll ruin his career like a shot!" Andy's animal magic: "Give me a pet frog and I'll dissect it"